October 22, 2014, 2:36 PM · For soloist Giora Schmidt, playing a modern violin is no Plan B. But coming around to that feeling of certainty was a major education and a long journey. 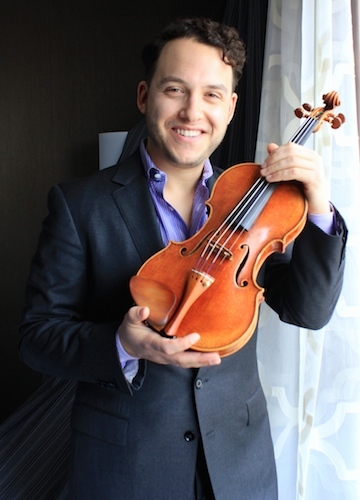 Giora spoke about his experience with modern violins at a lecture on violin quality that took place in Indianapolis last month as part of the International Violin Competition of Indianapolis and the Violin Society of America Convention. His familiarity with both old and new violins is also probably one reason why he was chosen as one of the 10 violinists who took part in the 2012 Paris Experiment, in which American violin maker Joseph Curtin and French acoustics researcher Claudia Fritz devised a scientific study to compare six old Italian violins to six modern violins. Giora Schmidt, the son of two professional musicians from Israel, began playing the violin when he was four, and he studied with some amazing teachers: Pinchas Zukerman, Dorothy DeLay and Itzhak Perlman among them. He also played some amazing violins early in his career: a 1753 Milan Guadagnini for about three years, and before that, a 1743 Guarneri del Gésu for about five. "You do everything you can to get a loan of something big," Giora said of his early playing days. Playing those fine violins for so many years, "I started to get really educated about the sound," he said. But like every loan, the time comes to an end, and you have to give the violin back. The question is always looming: Get another loan? Sell your soul to the devil to try and get a violin priced at $1 million or more? "I came to a decision, when the Guad had to be returned, that I would seek out the best modern instrument that I could for the concert stage." When he started looking into modern violins, he was happy to realize that not only was this feasible, it also appeared to have some advantages. "It was kind of exciting, and it was really eye-opening," Giora said. For him, one of most appealing features of newer violins is their ability to hold stable in changing environments; whereas violins that are several centuries old are notorious for being difficult to play when they are put under the stress of constant travel. For a soloist who is constantly crossing the globe for concerts in various locations, this is good news. "I can do a concert in the jungle of Brazil or the dryness of Alaska," Giora said. His modern violin "holds its pitch and always sounds good." He considered commissioning a violin but ultimately felt reluctant about the idea. What if you wait four years for a commissioned instrument and then you don't like it? The one that Giora bought "was available; he already had made it." And who made that violin? In 2011, after much research, Giora bought a violin made in 2000 by Hiroshi Iizuka, a Philadelphia-based luthier who actually specializes more in violas. Giora hasn't looked back. "I have concertmasters ask, 'What Guarneri are you playing?' or, 'What Guadagnini are you playing?'" Giora said. "Everyone who puts bow to the string looks for a different output," Giora said. For him, he really wanted a violin with power on the D string, for things like certain passages in the Tchaikovsky Concerto. He was pleasantly surprised at the difference in sticker price between an old Italian and a modern. Though he thought he'd have to spend $30,000 to $50,000 to get a fine modern, he spent less. For Giora, participating in the 2012 Paris Experiment validated his decision to buy modern and bolstered his confidence in modern instruments in general. "I tried violins priced in the millions that were not as exciting as some of the moderns I played in Paris," he said. Something he learned from Paris, where they played the violins with goggles on, is that it's easy to be deceived by looks. That gorgeous antique look does not always equate to a good-sounding violin. Sometimes violins are like Swiss cheese, "there are parts you love, and then there's a hole," he said. "Sometimes you just want a nice solid piece of cheddar!" Wearing the goggles, "I was surprised to see how, within three seconds, you know: absolutely not, or absolutely yes, or you need more time with a certain instrument," he said. "That kind of pre-selection process was something I'd never done." In the Paris Experiment, the violinists started testing instruments in a small rehearsal room, playing solo. For the next testing session, they moved to a larger, 300-seat concert hall and also had the option of piano accompaniment. "What we picked as our foremost (in the first session) changed in the hall," he said. Adding piano then changed perceptions further. "I felt some violins were really enjoyable for playing alone, then certain overtones got enhanced or diminished with the introduction of the piano," Giora said. The question is: Do you want a violin that covers all the bases: playing alone, playing with piano, playing with orchestra? For Giora, the answer was "yes." "All of that became very clear, and the results for me were astounding," he said. "All of my choices were modern instruments." Beyond each player's ultimate choice of instrument, the Paris Experiment took down a lot of data on player's specific reactions to every violin, with players rating instruments in six categories: overall quality, articulation, timbre, playability, projection, and loudness under the ear. "Joseph knew what I would like, based on Paris, and it was spot-on," Giora said. "There was one that stood alone for me, and it was exactly what the data predicted." The idea that modern violins can hold their own against million-dollar old Italians is good news for those of us who can't afford a million-dollar instrument (99.9 percent of us, would be a guesstimate). It means that "for the next generation there are options of instruments that are exciting and can hold their own against these instruments that have this mystique associated with them," he said. "I would like to see more of these players playing instruments by the great makers was have among us today," Giora said. "They are alive and well, and willing to work with you. It's not a Plan B to play something modern." Video copyright 2014 Stefan Avalos, as part of his documentary, "The Strad Project." October 22, 2014 at 10:20 PM · Great article! Really interesting to hear about the length of the strings between the bridge and the tailpiece. October 22, 2014 at 11:03 PM · Wonderful piece, Laurie. My daughter plays an Izuka viola--it's fantastic. October 23, 2014 at 02:08 AM · To me this was preaching to the choir, as I'm a big fan of fine contemporary work. But it was very nice to read and hear! October 23, 2014 at 04:23 AM · Laurie, thank you for covering this topic succinctly and effectively. I've spent an inordinate amount of time learning how to navigate the process of acquisition--in my case for my now-grown child--and more and more it became evident that not only should modern instruments be better, in general, than old antiques in theory, but that in fact it is so. I have met and spoken (sometimes at length) with quite a few current makers--some of them famous--even here on v-com. At Mondo Musica last year, we met a considerable number of famous makers--and tried lots of instruments and the quality and structural integrity is just so much better than old antiques! I think the principle reason modern is such a good choice--the best choice--is simply that the State of the Art today is far far better than it was in 1580 or 1692 or 1757 or 1812 etc. Speaking to the best makers--and also to up and coming makers--you discover that the understanding of the instrument is far more robust today than ever in history. Furthermore, the striving to build truly excellent instruments is clearly greater today than in the past. Actual antiques--yes even Stradivarii but especially del Gésu--were not well made compared to today's instruments. Furthermore, the acoustic research spearheaded by Carleen Hutchins and continued today by many, including Robert Spear, has created a theoretical as well as practical foundation for understanding how to tune the construction to achieve not only the ever changing "best" sound but in fact any particular flavor. Finally, modern makers are alive today. If you buy one, they can fix them! There isn't a great fear to deal with--they can always repair them and they are truly "as good as new" afterwards. Sure, the mystique is less mysterious with all this improved understanding, but the results are truly outstanding. As for Philadelphia--there is something going on there, fiddle-wise. Not only the aforementioned maker, Hiroshi Iizuka, but others as well, are there and producing outstanding instruments. One young one with extraordinary talent (why didn't I buy that one 4 years ago for only $5k?!) is Samuel Payton. Keep an eye on him. There's also a hot spot in Connecticut for both violins and violincellos. A number of makers live very near each other--including Mark Langdale Hough, Lawrence Wilke and some others. Ironically enough, my son currently has a late 19th century instrument in the stable--but I believe it is partially due to the excellent basic condition of the instrument, along with an excellent restoration by a repair specialist, that effectively transformed it into a modern, stable, well-built violin. There are good deals to be had in violins built between 1870 and 1940. There were a LOT of decent fiddles produced in that time frame and the best of them are in fact worth the money at between $1500 and $10,000 depending. October 23, 2014 at 04:44 AM · I just received an e-mail from Gregg Alf, and here is more background about the Alf violin that Kristi Gjezi used in this year's Indianapolis competition: Back in 1998, Gjezi's teacher, Svetlin Roussev, was actually a finalist in the IVCI. Roussev was told that his Amati violin was not going to cut it for the concerto finals, so Gregg Alf offered him a choice of some violins that he was showing at the event. He chose a copy that Alf had made of the Heifetz Guarneri. Roussev went on to win 4th place that year, and his host family in Indianapolis send him home with an unexpected prize: the Alf violin he had used for the finals! He continued to use the violin for the past 15 years or so. When the Nippon Foundation recently loaned him a 1710 Strad, he had idea to send the Alf violin back to Indianapolis in the hands of Kristi. October 23, 2014 at 06:59 AM · extremely interesting video, many thanks to Giora and Laurie for this video interview! October 23, 2014 at 02:24 PM · Great article and video! Thank you! October 24, 2014 at 05:07 AM · Thanks Laurie, for such an interesting piece. Giora is a great player, …it’s wonderful to see an artist who is so knowledgeable and so curious about their instrument. May I share something we learned recently about tuning the strings behind the bridge to a perfect 5th (usually not exactly 1/6th of the string length, due to the string windings). This is normally done by adjusting the little threaded nuts on plastic tailguts or by fiddling miserably with the knots on kevlar tailguts: A longer tailgut length will mean a shorter after-length, etc., and vice versa. But what if tuning the bridge after length was only part of the story? Violinmakers want to get to the bottom of such questions, and some colleagues at Oberlin came up with an experiment to test it. The after-length on various violins was detuned, admirably ruining the sound. Then the after-length was retuned, but by changing the length of the tailpiece itself, instead of the tailgut length. With each instrument, the tail-gut length was kept THE SAME and a different tailpiece of the same weight and design, but different length, was used. Not very feasible for every day practice, but a nicely designed experiment. Guess what? Tuning the bridge after-length did not make so much of a difference when tailgut length was removed from the equation. It seems that stiffness in the coupling between the tailpiece and the violin, which is also regulated by tailgut length, is equally or even more influential to the sound of a violin. When you think about it, the reason we began using kevlar tailguts to begin with was, as Giora pointed out, exactly because it adds more flexibility to this area, compared to plastic tailguts. Instruments that sound a little on the bright side, tend to sound better. So, having a longer or shorter after length BETWEEN THE TAILPIECE AND THE LOWER SADDLE, also changes the sound. It's just that we were looking so closely at the magical 1/6th of the string length and the fun and empirical tuning to perfect 5ths, that we were overlooking the important coupling effect dictated by tailgut length. October 25, 2014 at 04:21 PM · Absolutely fascinating video and I was intrigued by the comments he made about Zukermann etc. And the talk about grit in the sound. Also the A in first position on the G string. I tried that on my fiddle and it rang on a lot which must be good!